&a;ldquo;Many see pictures without knowing what to look at.&a;rdquo; – Bernard Berenson, &l;em&g;The Italian Painters of the Renaissance&l;/em&g;. Consider: The S&a;amp;P 500 Index got halved during the financial meltdown of 2008 &a;ndash; &a;lsquo;09. It took NASDAQ 15 years to regain its 2000 bubble peak. Don&a;rsquo;t ask me to go back to the Volcker induced crunch of 1982. Even worse. The market touched down at book value with 5-year Treasuries yielding 15%. Yes, 15%! It made Black Monday in &a;lsquo;87 look like just a chart squiggle. Financial data at the margin unfolds daily. Some 95% of what you see online or in the financial press is just noise which you disregard as garbage. Your macro point of view must diverge from the consensus. Later on, the consensus does fall into line. Over 6 months, if the facts don&a;rsquo;t confirm your thesis, fold your hand. Don&a;rsquo;t rationalize yourself into the poorhouse. But, close reading of quarterly reports and 10Ks is a must to gauge the dynamics of unfolding growth. The reason for corporate due diligence is to muster your courage to build on or unwind positions without inhibition. I did this years ago with Citigroup, Bank of America, Sirius XM Holdings, Gilead Sciences, Boeing and Las Vegas Sands. Conversely, I couldn&a;rsquo;t buy into the technology rout back in 2000 – &a;lsquo;01 because there were serious valuation issues and inventory gluts while capital spending had dried up in the country. Historical memory is useful as an evaluation tool in appraising the entire market, but not for specific stocks. I had to terminate a bright fiftyish tech analyst because his image of IBM, Texas Instruments and Motorola was formed a decade earlier. Later, he missed Apple and preferred Yahoo over Google. I&a;rsquo;ve grabbed corporate files a foot thick and dumped them in the trash basket as impediments to perception. Unlike many operators of my generation, I&a;rsquo;ve eschewed short selling because it screws up my head, making me anxious. I&a;rsquo;ve bought calls and written puts but only to quiet me down and re-concentrate on maximizing bull market plays. Anyone left who hasn&a;rsquo;t studied Buffett&a;rsquo;s style should at least read one of his annual reports. Over 40 years ago, Secretariat won the Belmont Stakes, going away by 31 lengths. Big Red&a;rsquo;s record of 2:24 for 12 furlongs still stands. Alas, the stock market contains no big capitalization properties in Secretariat&a;rsquo;s class. Apple started it&a;rsquo;s run from low thirties so we&a;rsquo;re talking near 30 times on your money. Alphabet remains a contender to Apple but 2014 was a negative year. Mike Milken and his crowd came close to Secretariat&a;rsquo;s bold moves. But, they did it with OPM (other people&a;rsquo;s money) raised for the honchos using 10 to 1 leverage on takeovers. Mike lugged around 2 lawyers briefcases filled with &a;ldquo;deal&a;rdquo; papers that were actionable. Facebook and Alibaba may contain hearts as big as Secretariat&a;rsquo;s, but they first went to the moon backed by V.C.s (venture capitalists). During Secretariat&a;rsquo;s reign, 1973, the market faltered badly, a wet track, one horrendous recession induced by real estate overspeculation. Early sixties, great fortunes were made by tech honchos and later some conglomerateurs, more a 1980s phenomenon. In the sixties, few investors even knew how a hedge fund operated. A pool of $20 million tabbed you as a big operator. Microsoft first went public in the early eighties. Today, there are dozens of $20 billion money pools, some concentrated in Apple, Micron Technology, even General Motors. My patience and perseverance are found elsewhere, but frustrations and mistakes of commission and omission are enormous, namely selling artworks prematurely. I&a;rsquo;m talking about the contemporary art market scene where my involvement dates back to early fifties when abstract expressionism was taking off in the Big Apple. Namely, Jackson Pollock, Mark Rothko, Willem de Kooning, Clyfford Still, Jasper Johns, Roy Liechtenstein and others were young and prolific along with Franz Kline, Alberto Giacometti and guys on the C&a;ocirc;te d&a;rsquo;Azur, the great colorist Marc Chagall was entrenched, happily. My excuse was I liked Rothko et al but in 1954 couldn&a;rsquo;t come up with even $1,200 for a canvas at his initial &a;lsquo;54 show at Betty Parsons Gallery in New York. Just back from the Korean War, penniless and unemployed. My M.O. was buying canvases from friends, artist without galleries. The going rate was $300 and you paid off your purchase $25, monthly. There ain&a;rsquo;t space to enumerate all my stupidities in the art market which embraced Warhol, Richter, Jeff Koons and Christopher Wool&a;rsquo;s later paintings. Like stocks, I sold paintings when they began to bore me. This is a no-no, because there&a;rsquo;s always another generation coming along getting its feet wet in terms of perception and taste. Such honchos dangle in the grip of advisors and auction house executives. Art for them is a commodity like pork bellies and gold. They&a;rsquo;re told to put 10% of wealth in art and mainly comply. In the art world there are juicy back stories. Now, for mine. Jean-Michel Basquiat&a;rsquo;s best work was painted in 1982. An &a;lsquo;82 piece recently went off at auction for $100 million. Back in &a;lsquo;82 I was introduced to Basquiat&a;rsquo;s work by Mary Boone whose gallery was housed next door to Annina Nosei&a;rsquo;s space where she had confined Jean-Michel in her basement. He was painting fast and furiously, knocking off a piece in a couple of hours and then moving on. I could have bought half a dozen Basquiats in 1982 for $15,000, now worth half a billion. No 10Qs to read or conferences to attend. Just put &a;lsquo;em in the warehouse or on your walls for 50 years. Collectors I know buy 20 or 30 pieces by one artist, warehouse them for decades and then feed them out into the auction market. If you refer to a compound interest table you&a;rsquo;ll find these are better returns than Buffett logged over 50 years of intensive investing. Even contemporary art indices based on auction prices don&a;rsquo;t do justice to the tremendous moves within subcategories. We&a;rsquo;re talking more like V.C. rates of return. Steve Cohen and Steve Wynn are blue chip buyers in the art market, but more intensive speculators in securities. Subliminally, they must know they&a;rsquo;re overmatched in art but not on the Big Board. Same goes for Leon Black. To make even hundreds of millions in financial markets you can&a;rsquo;t afford any big down years. Don&a;rsquo;t ever own a property that can&a;rsquo;t come back big. Polaroid and Eastman Kodak come to mind, maybe Xerox and IBM today. Dead paper. 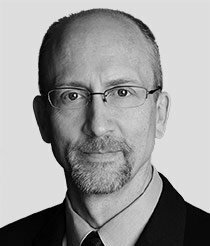 The way money is managed by big institutions for passive investors is a sham. They&a;rsquo;ll put you in 10 to 20 investment categories covering everything from gold to emerging market debt. There is no underlying theme therein, except saving the money manager from extreme underperformance and criticism. Short of entrepreneurial genius, options leverage and raking off 20% of the profits running $10 billion hedge funds or a private equity construct, these individual players must put together a long string of felicitous investment results. Commodity plays, gold and currencies seem too treacherous. Subscribe to a chart service, not a stock market technician&a;rsquo;s music sheets, but quarterly economic charts that date back 50 years. The objective is to understand historical norms, how the country and major corporations function and what turns them dysfunctional. Keeping up with macro numbers earns you the right to call inflection points and take a contrarian point of view. Thoughtful individual investors may not have great information retrieval capacity but do make calls on tsunami events like the Cuban missile crisis, Black Monday, the Lehman Brothers bankruptcy and the 2008 &a;ndash; &a;lsquo;09 financial meltdown. You do all this by relating panic lows to historic valuation yardsticks. When the market touches down at book value and yields over 5%, push your chips into the pot. You&a;rsquo;re on firm ground, historically speaking. Today, the market sells at 2 times book value, yields under 2% with the price-earnings ratio at 17 on projected 12-month forward earnings, not at 10 times market lows. The question now is how long can the good times last? Maybe next week I&a;rsquo;ll deal with financial cycles. Comparing real rates of return for mainly emotional plays like art with financial assets since 1900, art comes between stamps and violins, but is outdistanced by equities nearing 150%. Since 2000, both art and equities traced W-like formations, not topped until late 2014. Art&a;rsquo;s 3% hundred-year rate of return compares with 7% for equities. Putting serious money in art is betting against history. Where will Jeff Koons, Basquiat and Warhol sell 50 years from now? My guess is lower than today&a;rsquo;s prices. If you&a;rsquo;re early, smart and don&a;rsquo;t rely on making money in art you&a;rsquo;ll probably come out a big winner. I&a;rsquo;ve learned all this by making my own mistakes. If I somehow had bought a Mark Rothko piece even late fifties and assuming current auction prices of say $40 million, annualized compound rate of return for 50 years approximates 25%. Now you know how Buffett made his gelt. For the Sosnoffs there was an invisible crossover point where the art collection exceeded financial assets. Never dreamed of this happening but time works on peculiar ironies. Conceptually, I didn&a;rsquo;t give enough weight to how newly made billionaires would throw money into art as objects of value. If lightning strikes for you, assume nobody believes you short of an audit. In 1964, I phoned my dad in Key West and excitedly blurted out I was a millionaire. Pop dismissed this utterance out of hand. His Russian peasant&a;rsquo;s mentality couldn&a;rsquo;t accommodate such largesse embracing his family. Transactions in art annually, tot up to no more than a few hours trading on the Big Board. For Bernard Berenson, owning a 34,000-volume library at Villa I Tatti outside of Florence, a good rough test of value was whether you felt reconnected with life upon looking at a painting. The research came later. The final irony is new money foolishly marked up my collection. I lucked out. This entry was posted in Top Stocks on May 31, 2018 by ggkandy. Every week, I compile a table of all U.S.-listed stocks with dividend yields of 10% or higher. Some of the names come and go, while others reappear time and again. I’ve become familiar with many of them, and can safely say that the list is dominated by tiny companies with market caps between $50 million and $300 million. One tiny blockchain stock could secure Canada’s $8.7 BILLION cannabis market. BUY shares today for less than $1.00! Shares could rocket 818% higher when news gets out. Click here ASAP. Some of these are even smaller nano-caps, such as medical device maker Digirad (Nasdaq: DRAD), whose entire market value is just $36 million. There is absolutely nothing wrong with small businesses. I own shares of quite a few in my personal account. But for the most part, I use them to fill out the growth sleeve of my portfolio and don’t consider them stable income producers. This entry was posted in Top Stocks and tagged CPHI, FFNW, SSBI, XIN on May 31, 2018 by ggkandy. Boston Beer Company Inc (NYSE:SAM) shares reached a new 52-week high and low on Wednesday . The stock traded as low as $255.13 and last traded at $255.35, with a volume of 1165 shares traded. The stock had previously closed at $251.50. Several research analysts have recently weighed in on the stock. ValuEngine raised shares of Boston Beer from a “hold” rating to a “buy” rating in a research report on Tuesday. Zacks Investment Research raised shares of Boston Beer from a “hold” rating to a “buy” rating and set a $257.00 target price on the stock in a research report on Monday, April 30th. Macquarie lifted their target price on shares of Boston Beer from $200.00 to $225.00 and gave the stock a “neutral” rating in a research report on Thursday, April 26th. Stifel Nicolaus lifted their target price on shares of Boston Beer from $169.00 to $235.00 and gave the stock a “hold” rating in a research report on Thursday, April 26th. Finally, BMO Capital Markets reissued a “hold” rating and issued a $210.00 target price on shares of Boston Beer in a research report on Wednesday, April 18th. Thirteen analysts have rated the stock with a hold rating and two have given a buy rating to the stock. The stock presently has a consensus rating of “Hold” and an average price target of $189.08. The stock has a market cap of $2.82 billion, a P/E ratio of 42.63, a P/E/G ratio of 3.43 and a beta of 0.48. Boston Beer (NYSE:SAM) last announced its quarterly earnings data on Wednesday, April 25th. The company reported $0.55 EPS for the quarter, beating the Zacks’ consensus estimate of $0.30 by $0.25. Boston Beer had a net margin of 11.09% and a return on equity of 18.74%. The firm had revenue of $190.50 million for the quarter, compared to the consensus estimate of $174.87 million. During the same period in the previous year, the firm posted $0.45 earnings per share. The firm’s revenue was up 17.8% on a year-over-year basis. research analysts expect that Boston Beer Company Inc will post 7.37 EPS for the current fiscal year. In other Boston Beer news, VP David L. Grinnell sold 1,000 shares of Boston Beer stock in a transaction that occurred on Thursday, April 26th. The shares were sold at an average price of $235.00, for a total value of $235,000.00. The transaction was disclosed in a legal filing with the Securities & Exchange Commission, which can be accessed through the SEC website. Insiders sold 4,000 shares of company stock valued at $880,000 over the last quarter. Corporate insiders own 29.20% of the company’s stock. Hedge funds and other institutional investors have recently bought and sold shares of the business. The Manufacturers Life Insurance Company lifted its stake in Boston Beer by 6.8% in the fourth quarter. The Manufacturers Life Insurance Company now owns 23,669 shares of the company’s stock valued at $4,524,000 after acquiring an additional 1,500 shares during the last quarter. Renaissance Technologies LLC lifted its stake in Boston Beer by 294.3% in the fourth quarter. Renaissance Technologies LLC now owns 41,800 shares of the company’s stock valued at $7,988,000 after acquiring an additional 31,200 shares during the last quarter. Goldman Sachs Group Inc. lifted its stake in Boston Beer by 1.1% in the fourth quarter. Goldman Sachs Group Inc. now owns 123,880 shares of the company’s stock valued at $23,674,000 after acquiring an additional 1,385 shares during the last quarter. Smith Asset Management Group LP lifted its stake in Boston Beer by 12.9% in the fourth quarter. Smith Asset Management Group LP now owns 24,103 shares of the company’s stock valued at $4,606,000 after acquiring an additional 2,763 shares during the last quarter. Finally, Oppenheimer & Co. Inc. acquired a new stake in Boston Beer in the fourth quarter valued at approximately $219,000. Hedge funds and other institutional investors own 73.47% of the company’s stock. The Boston Beer Company, Inc produces and sells alcohol beverages primarily in the United States. The company's flagship beer is Samuel Adams Boston Lager. It sells approximately 60 beers under the Samuel Adams brand names; 10 flavored malt beverages under the Twisted Tea brand name; 20 hard cider beverages under the Angry Orchard brand; 5 hard sparkling waters under the Truly Spiked & Sparkling brand name; and approximately 50 beers under 4 brand names. And in just two years, the former Expedia CEO helped Expedia’s market cap climb from $8.3 billion in 2015 to $21.75 billion in 2017. He’s proven himself as a capable leader, but he has a challenging road ahead of him with Uber. In 2016, the ride-hailing app lost $2.8 billion. In 2017, Uber’s losses increased 60.71%, to $4.5 billion. On top of billion-dollar challenge, the new Uber CEO is tasked with a complete overhaul of the company’s controversial work culture. 19, 2017: Susan Fowler, a former engineer for the company, alleged in a blog post that she was sexually harassed. 23, 2017: Alphabet Inc. (Nasdaq:GOOGL) sues Uber for intellectual property theft. 27, 2017: Former CEO Travis Kalanick asks Uber Senior Vice President of Engineering Amit Singhal to step down amid emerging sexual harassment allegations from when he formerly worked at Google. 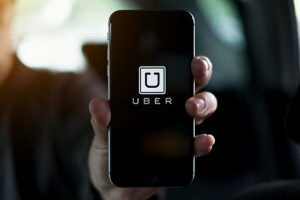 March 25, 2017: Uber suspended its self-driving car program in Arizona after a vehicle was involved in a crash. Even though Khosrowshahi may be a great leader for Uber, we don’t want anything to do with an Uber IPO right now. The company isn’t profitable, and there could be more fallouts from scandals before Khosrowshahi’s tenure that emerge. Yes, Uber isn’t profitable, but private investors are willing to fork over billions of dollars to keep the company running. Uber has raised nearly $22 billion since 2009, according to CrunchBase.com. Fortunately, you don’t need millions of dollars to buy a building and rent it out to Uber. Through investing in a specific real estate investment trust (REIT), you can profit from Uber’s growth. This entry was posted in Top Stocks on May 30, 2018 by ggkandy. Shares of Glenmark Pharma touched 52-week low of Rs 483.60, falling 9 percent in the opening trade on Wednesday on the back of poor fourth quarter numbers. The company has reported 17.5 percent fall in its Q4 net profit at Rs 151.6 crore against Rs 183.7 crore in the same quarter last fiscal. The operating profit or EBITDA of the company was down 26 percent at Rs 326.8 crore and margin was at 14.3 percent. The board has recommended dividend at 200 percent i.e. Rs 2 per share for the financial year 2017-2018. For FY19 the company keep the guidance of 10-15 percent topline growth, while ex-US, the other geographies should grow 10-15% in FY19. The company has filed 7 ANDAs with USFDA this quarter and registered a price erosion at 12 percent against 10-12 percent in US. US market will continue to remain a challenging environment for next 4 quarters, company said. Glenn Saldanha, Chairman & MD, Glenmark Pharmaceuticals said, While FY 2018 was a challenging year mainly on account of pricing pressure in the US, our other key markets like Europe and India performed well on the back of new product launches. Even though we expect pricing pressure to persist, we are glad that FY 2019 has started on a positive note for us with approval s for some interesting products in the US, he added. The company at its meeting held on May 29 approved the draft share purchase agreement to acquire 100 percent stake in Zorg Laboratories for an aggregate consideration of Rs 5 lakh before adjustments and subject to legal and financial due diligence. At 09:17 hrs Glenmark Pharma was quoting at Rs 508.45, down Rs 22.55, or 4.25 percent on the BSE. Blackbaud Inc (NASDAQ:BLKB) files its latest 10-K with SEC for the fiscal year ended on December 31, 2017. Blackbaud Inc provides constituent relationship-management, marketing, and financial-management software for the philanthropic, nonprofit, and higher education markets. Blackbaud Inc has a market cap of $4.81 billion; its shares were traded at around $100.12 with a P/E ratio of 73.07 and P/S ratio of 6.06. The dividend yield of Blackbaud Inc stocks is 0.48%. Blackbaud Inc had annual average EBITDA growth of 8.40% over the past ten years. GuruFocus rated Blackbaud Inc the business predictability rank of 4-star. For the last quarter Blackbaud Inc reported a revenue of $217.0 million, compared with the revenue of $198.3 million during the same period a year ago. For the latest fiscal year the company reported a revenue of $788.3 million, an increase of 7.9% from last year. For the last five years Blackbaud Inc had an average revenue growth rate of 12.3% a year. The reported diluted earnings per share was $1.38 for the year, an increase of 56.8% from previous year. Over the last five years Blackbaud Inc had an EPS growth rate of 40.1% a year. The Blackbaud Inc had an operating margin of 8.12%, compared with the operating margin of 8.46% a year before. The 10-year historical median operating margin of Blackbaud Inc is 9.35%. The profitability rank of the company is 8 (out of 10). Anheuser-Busch InBev SA/NV (NYSE: BUD) is estimated to report quarterly earnings at $0.89 per share on revenue of $13.06 billion. SINA Corporation (NASDAQ: SINA) is expected to report quarterly earnings at $0.42 per share on revenue of $433.32 million. Weibo Corporation (NASDAQ: WB) is projected to report quarterly earnings at $0.47 per share on revenue of $342.39 million. Ameren Corporation (NYSE: AEE) is estimated to report quarterly earnings at $0.57 per share on revenue of $1.55 billion. Mylan N.V. (NASDAQ: MYL) is projected to report quarterly earnings at $0.98 per share on revenue of $2.75 billion. Cinemark Holdings, Inc. (NYSE: CNK) is estimated to report quarterly earnings at $1.31 per share on revenue of $1.51 billion. ADT Inc. (NYSE: ADT) is expected to report quarterly earnings at $0.24 per share on revenue of $1.11 billion. Coty Inc. (NYSE: COTY) is projected to report quarterly earnings at $0.13 per share on revenue of $2.18 billion. Pinnacle Entertainment, Inc. (NYSE: PNK) is estimated to report quarterly earnings at $0.31 per share on revenue of $644.94 million. Conduent Incorporated (NYSE: CNDT) is estimated to report quarterly earnings at $0.21 per share on revenue of $1.44 billion. Delphi Technologies PLC (NYSE: DLPH) is projected to report quarterly earnings at $1.16 per share on revenue of $1.25 billion. Office Depot, Inc. (NASDAQ: ODP) is expected to report quarterly earnings at $0.08 per share on revenue of $2.72 billion. Global Partners LP (NYSE: GLP) is estimated to report quarterly earnings at $0.13 per share on revenue of $2.33 billion. Wolverine World Wide, Inc. (NYSE: WWW) is projected to report quarterly earnings at $0.37 per share on revenue of $530.99 million. Performance Food Group Company (NYSE: PFGC) is expected to report quarterly earnings at $0.32 per share on revenue of $4.46 billion. Hodges Capital Management Inc. raised its stake in Cinemark Holdings, Inc. (NYSE:CNK) by 2.0% during the first quarter, according to the company in its most recent Form 13F filing with the Securities & Exchange Commission. The fund owned 311,681 shares of the company’s stock after acquiring an additional 6,234 shares during the quarter. Hodges Capital Management Inc. owned approximately 0.27% of Cinemark worth $11,741,000 as of its most recent filing with the Securities & Exchange Commission. A number of institutional investors have recently added to or reduced their stakes in the business. Victory Capital Management Inc. increased its position in Cinemark by 73.2% during the fourth quarter. Victory Capital Management Inc. now owns 6,081,823 shares of the company’s stock worth $211,768,000 after buying an additional 2,570,923 shares in the last quarter. Rivulet Capital LLC increased its position in Cinemark by 88.0% during the fourth quarter. Rivulet Capital LLC now owns 2,859,216 shares of the company’s stock worth $99,558,000 after buying an additional 1,338,000 shares in the last quarter. River Road Asset Management LLC increased its position in Cinemark by 1.9% during the fourth quarter. River Road Asset Management LLC now owns 2,312,832 shares of the company’s stock worth $80,533,000 after buying an additional 42,982 shares in the last quarter. Bank of New York Mellon Corp increased its position in Cinemark by 4.0% during the fourth quarter. Bank of New York Mellon Corp now owns 1,728,543 shares of the company’s stock worth $60,187,000 after buying an additional 66,700 shares in the last quarter. Finally, Dimensional Fund Advisors LP increased its position in Cinemark by 3.4% during the third quarter. Dimensional Fund Advisors LP now owns 1,334,140 shares of the company’s stock worth $48,310,000 after buying an additional 43,606 shares in the last quarter. 94.03% of the stock is owned by institutional investors. PPL Co. (NYSE:PPL) was the recipient of a significant decrease in short interest during the month of April. As of April 30th, there was short interest totalling 17,988,914 shares, a decrease of 18.2% from the April 13th total of 22,001,974 shares. Based on an average daily volume of 5,372,103 shares, the short-interest ratio is presently 3.3 days. Approximately 2.6% of the company’s shares are short sold. Wall Street brokerages expect Pembina Pipeline (NYSE:PBA) (TSE:PPL) to report $1.51 billion in sales for the current quarter, according to Zacks Investment Research. Two analysts have made estimates for Pembina Pipeline’s earnings, with the lowest sales estimate coming in at $1.19 billion and the highest estimate coming in at $1.83 billion. Pembina Pipeline posted sales of $866.72 million during the same quarter last year, which would indicate a positive year over year growth rate of 74.2%. The firm is expected to issue its next quarterly earnings results on Tuesday, August 7th. If this is, indeed, the case, investors have a handful of high quality names at attractive prices to choose from. One that has popped up on my radar is PPL Corporation (NYSE: PPL). PPL Corp. (NYSE: PPL) traded down about 1.3% Thursday to post a new 52-week low of $26.65 after closing Wednesday at $27.01. The stock’s 52-week high is $40.20 Volume was about 35% below the daily average of around 7 million shares. The company had no specific news. Markets have been under pressure once again by the U.S. Federal Reserve. Inflation levels are going through the roof… but the people in charge of managing it have been lying to Americans for years. Now, it’s time to get even.Money MorningLiquidity Specialist Lee Adler has the perfect way to make a lot of money when no one is looking.Read it here. Markets are cheering news that the supposed trade war between the United States and China is “on hold,” according to U.S. Treasury Secretary Steven Mnuchin. Mnuchin and U.S. President Donald Trump’s top economic advisor, Larry Kudlow, announced that both nations have reached an agreement, one that established a framework to help address ongoing trade imbalances between the two countries. The prices of crude oil is in focus after Venezuelan President Nicolas Maduro won reelection over the weekend. The election featured a very low turnout and a very large outcry that the vote was rigged. Maduro has a 75% disapproval rating and has been the face of the OPEC member’s widespread mismanagement and economic collapse. Prior to the election, a member of the Trump administration said that the United States would not recognize the authenticity of the election. The United States is considering additional sanctions on Venezuela. Today is a major day for mergers and acquisition activity. Today, Blackstone Group LP(NYSE: BX) announced plans to purchase U.S. hotel operator LaSalle Hotel Properties (NYSE: LHO) for a whopping $3.7 billion. The deal comes at a time that the travel industry is experiencing one of the best periods in a decade. If you’re looking for a way to make money ahead of Memorial Day weekend, we show you how here. Victory Capital Management Inc. grew its stake in shares of Nordson Co. (NASDAQ:NDSN) by 10.6% in the 1st quarter, according to the company in its most recent Form 13F filing with the Securities & Exchange Commission. The fund owned 16,868 shares of the industrial products company’s stock after purchasing an additional 1,612 shares during the period. Victory Capital Management Inc.’s holdings in Nordson were worth $2,300,000 as of its most recent SEC filing. Nordson Corporation(NASDAQ:NDSN)announced solid fiscal second-quarter 2018 results on Monday after the market closed, including an expected decline in organic volume that was more than offset by acquisitive growth. State Board of Administration of Florida Retirement System trimmed its stake in shares of Nucor (NYSE:NUE) by 5.1% in the 1st quarter, according to the company in its most recent Form 13F filing with the Securities & Exchange Commission. The fund owned 441,516 shares of the basic materials company’s stock after selling 23,506 shares during the period. State Board of Administration of Florida Retirement System owned about 0.14% of Nucor worth $26,972,000 as of its most recent SEC filing. Neuburgh Advisers LLC lowered its stake in shares of Nucor (NYSE:NUE) by 40.1% during the 1st quarter, according to the company in its most recent Form 13F filing with the Securities and Exchange Commission (SEC). The fund owned 6,464 shares of the basic materials company’s stock after selling 4,320 shares during the period. Neuburgh Advisers LLC’s holdings in Nucor were worth $395,000 as of its most recent filing with the Securities and Exchange Commission (SEC). Prudential Financial Inc. boosted its stake in ONEOK (NYSE:OKE) by 1.0% during the 1st quarter, according to its most recent Form 13F filing with the Securities and Exchange Commission (SEC). The institutional investor owned 535,375 shares of the utilities provider’s stock after acquiring an additional 5,560 shares during the period. Prudential Financial Inc.’s holdings in ONEOK were worth $30,474,000 at the end of the most recent reporting period. The volatile price of natural gas over the past year has weighed some on this top energy stock. ONEOK Inc. (NYSE: OKE) primarily engages in natural gas transportation, storage and natural gas and natural gas liquids (NGLs) gathering, processing and fractionation in the Bakken, Mid-Continent and Permian. The company recently closed the roll-up of its underlying master limited partnership, ONEOK Partners. Investing in retirement requires a different focus, usually one that includes a prominent place for dividend income. If dividend-paying stocks are what you’re looking for, then you should take a closer look at high-yielding Duke Energy Corporation (NYSE:DUK), ONEOK, Inc. (NYSE:OKE), and W.P. Carey Inc. (NYSE:WPC). They offer dividend yields of 4%, 5%, and 6%, respectively… income that could materially increase your retirement “paycheck” and help to supplement Social Security. ONEOK (NYSE:OKE) – Analysts at US Capital Advisors raised their FY2018 EPS estimates for ONEOK in a research report issued to clients and investors on Monday, May 14th. US Capital Advisors analyst B. Followill now anticipates that the utilities provider will post earnings of $2.74 per share for the year, up from their previous forecast of $2.56. US Capital Advisors also issued estimates for ONEOK’s Q4 2018 earnings at $0.74 EPS and FY2019 earnings at $2.95 EPS. This entry was posted in Top Stocks and tagged CNK, NDSN, NUE, OKE, PPL on May 30, 2018 by ggkandy. New York, NY, based Investment company Scopia Capital Management Llc buys Mallinckrodt PLC, ARRIS International PLC, Tenet Healthcare Corp, PTC Therapeutics Inc, Vistra Energy Corp, Baidu Inc, Weatherford International PLC, Acuity Brands Inc, Sanderson Farms Inc, La Jolla Pharmaceutical Co, sells Netflix Inc, Targa Resources Corp, GW Pharmaceuticals PLC, Altice USA Inc, Equifax Inc during the 3-months ended 2018-03-31, according to the most recent filings of the investment company, Scopia Capital Management Llc. As of 2018-03-31, Scopia Capital Management Llc owns 32 stocks with a total value of $5 billion. These are the details of the buys and sells. Scopia Capital Management Llc initiated holding in ARRIS International PLC. The purchase prices were between $23.17 and $27.88, with an estimated average price of $25.83. The stock is now traded at around $25.56. The impact to a portfolio due to this purchase was 1%. The holding were 1,877,607 shares as of 2018-03-31. Scopia Capital Management Llc initiated holding in Tenet Healthcare Corp. The purchase prices were between $14.77 and $25.12, with an estimated average price of $19.91. The stock is now traded at around $35.34. The impact to a portfolio due to this purchase was 0.97%. The holding were 1,998,511 shares as of 2018-03-31. Scopia Capital Management Llc initiated holding in Acuity Brands Inc. The purchase prices were between $132.4 and $185.73, with an estimated average price of $153.84. The stock is now traded at around $118.93. The impact to a portfolio due to this purchase was 0.59%. The holding were 213,490 shares as of 2018-03-31. Scopia Capital Management Llc initiated holding in Sanderson Farms Inc. The purchase prices were between $117.42 and $136.29, with an estimated average price of $127.23. The stock is now traded at around $103.08. The impact to a portfolio due to this purchase was 0.57%. The holding were 238,635 shares as of 2018-03-31. Scopia Capital Management Llc initiated holding in La Jolla Pharmaceutical Co. The purchase prices were between $28.17 and $39.24, with an estimated average price of $32.24. The stock is now traded at around $31.93. The impact to a portfolio due to this purchase was 0.34%. The holding were 578,145 shares as of 2018-03-31. Scopia Capital Management Llc initiated holding in Fossil Group Inc. The purchase prices were between $7.34 and $16.97, with an estimated average price of $11.05. The stock is now traded at around $21.03. The impact to a portfolio due to this purchase was 0.1%. The holding were 395,925 shares as of 2018-03-31. Scopia Capital Management Llc added to a holding in Mallinckrodt PLC by 111.16%. The purchase prices were between $13.88 and $23.52, with an estimated average price of $18.04. The stock is now traded at around $16.65. The impact to a portfolio due to this purchase was 1.32%. The holding were 8,626,365 shares as of 2018-03-31. Scopia Capital Management Llc added to a holding in PTC Therapeutics Inc by 42.74%. The purchase prices were between $17.46 and $32.59, with an estimated average price of $25.34. The stock is now traded at around $30.97. The impact to a portfolio due to this purchase was 0.96%. The holding were 5,914,052 shares as of 2018-03-31. Scopia Capital Management Llc added to a holding in Vistra Energy Corp by 28.54%. The purchase prices were between $17.46 and $21.13, with an estimated average price of $19.32. The stock is now traded at around $24.01. The impact to a portfolio due to this purchase was 0.82%. The holding were 8,838,184 shares as of 2018-03-31. Scopia Capital Management Llc added to a holding in Baidu Inc by 23.61%. The purchase prices were between $212.07 and $265.67, with an estimated average price of $246.43. The stock is now traded at around $242.05. The impact to a portfolio due to this purchase was 0.75%. The holding were 878,740 shares as of 2018-03-31. Scopia Capital Management Llc added to a holding in Weatherford International PLC by 51.86%. The purchase prices were between $2.27 and $4.33, with an estimated average price of $3.19. The stock is now traded at around $3.34. The impact to a portfolio due to this purchase was 0.61%. The holding were 38,831,172 shares as of 2018-03-31. Scopia Capital Management Llc sold out a holding in Targa Resources Corp. The sale prices were between $43.74 and $51.44, with an estimated average price of $47.63. 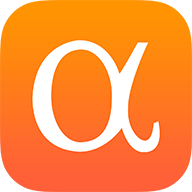 Scopia Capital Management Llc sold out a holding in Altice USA Inc. The sale prices were between $17.92 and $23.27, with an estimated average price of $20.48. Scopia Capital Management Llc sold out a holding in Equifax Inc. The sale prices were between $111.5 and $127.49, with an estimated average price of $120.04. Scopia Capital Management Llc sold out a holding in Advanced Accelerator Applications SA. The sale prices were between $80.42 and $82.32, with an estimated average price of $81.7. Scopia Capital Management Llc sold out a holding in Radius Health Inc. The sale prices were between $32.9 and $40.22, with an estimated average price of $36.13. Southern Co. will sell nearly all the assets it owns in Florida to NextEra Energy Inc. for $5.1 billion as the utility owner pushes to cut debt and pursue a long-delayed nuclear project. The sale, which includes Gulf Power and Florida City Gas, comes as Atlanta-based Southern has been forging ahead with plans for the first new U.S. nuclear power plant in decades, a project that’s faced construction delays and costs that have soared to more than $25 billion. Earlier this month Chief Executive Officer Tom Fanning told investors that Southern, which is down 10 percent this year, needed to raise cash to cut debt, boost utility returns and pay for the new reactors. NextEra, meanwhile, is buying into a region it knows well. Dynamic Advisor Solutions LLC bought a new stake in Vanguard Value ETF (NYSEARCA:VTV) in the 1st quarter, according to its most recent filing with the Securities and Exchange Commission (SEC). The firm bought 3,421 shares of the company’s stock, valued at approximately $353,000. Isotechnika Pharma Inc. (NASDAQ:AUPH) (TSE:AUP) shares rose 6.7% during trading on Friday . The stock traded as high as $5.68 and last traded at $5.59. Approximately 54,590 shares traded hands during mid-day trading, a decline of 87% from the average daily volume of 429,596 shares. The stock had previously closed at $5.24. Shares of Aurinia Pharmaceuticals Inc. (NASDAQ:AUPH),a clinical-stage biotech, are on the rise following the company’s first-quarter earnings report. Plans to expand voclosporin, the company’s lupus candidate, to a much larger indication inspired investors to push the shares 10.2% higher as of 1:03 p.m. Monday. That statement comes to mind when I think about Aurinia Pharmaceuticals (NASDAQ:AUPH). The potential for the clinical-stage biotech appears to be so great that getting greedy with the stock is tempting. This entry was posted in Top Stocks and tagged AUPH, MDSO, VTV on May 30, 2018 by ggkandy. Over the course of four hours on Tuesday, 175,000 Starbucks employees talked about racial bias. Across the country, employees participated in a mandatory training. About 8,000 company-owned stores and offices were closed to customers for the afternoon. In self-guided groups of three to five, workers settled in for an intense afternoon. Groups moved at their own pace, but their discussions followed a similar structure. With the help of guidebooks distributed throughout the stores,workers took part in sensitive conversations. They watched videos featuring Starbucks executives and musician and activist Common. They reflected by themselves, in pairs and as a group, on the meaning of bias. They privately jotted down thoughts in a customized notebook outfitted with prompts about identity and race. They ran through scenarios that may elicit a biased reaction. They practiced welcoming behaviors, and committed to changing their habits for the better. The company announced the training soon after two black men were arrested at a store in Philadelphia while waiting for a friend, an incident that Starbucks Chairman Howard Schultz called “reprehensible” in an open letter to customers. The letter also ran as a full-page ad in the New York Times, USA Today and two Philadelphia papers. Starbucks found that “insufficient support and training” and “bias” led a former white employee to call police on the two men, Schultz said. A sign alerts customers that the store is closed for the afternoon. To develop the training, Starbucks cast a wide net. The afternoon’s curriculum was developed by a team of more than 30 experts, including neuroscientists, diversity and inclusion experts and community outreach leaders. Sherrilyn Ifill, president of the NAACP Legal Defense and Education Fund, Heather McGhee, president of the public policy organization Demos, and others served as unpaid advisers. Through Ifill, Starbucks reached out to documentary filmmaker Stanley Nelson, who created a seven-minute long film about racial bias for the training. The short film is licensed to Nelson, who created it independently from Starbucks, a company spokesperson said. Nelson’s movie shows people talking about the biases they face every day, and it includes cell phone footage of individuals documenting instances of microaggressions or harassment, including an employee following a black customer through a store. The clips include ones that have gone viral, like a video of lawyer Aaron Schlossberg ranting against people speaking Spanish and one of a horrified passenger reacting to a man being dragged down an airplane aisle by officials. “We felt it was really important to be as up-to-date as we possibly could,” Nelson told CNNMoney, adding that most of the footage shows extreme examples of the types of bias people face every day. “We tried not to highlight any particular companies,” Nelson added. The training is just one step in making sure that nothing like the arrest ever happens again, the company said. Starbucks recently changed its policy to allow people who haven’t made a purchase to spend time in stores or use the bathroom. “We realize that four hours of training is not going to solve racial inequity in America,” Starbucks Chairman Howard Schultz told CNN’s Poppy Harlow on Tuesday. Schultz told CNN that the trainings will be incorporated into employee onboarding, and that the 7,000 licensed stores including those operated by hotels, grocery stores and airports that did not participate in the training today will do so over the next year. Materials from Tuesday’s event are being made available to the public. Starbucks hopes that they will be used by other companies conducting similar trainings. 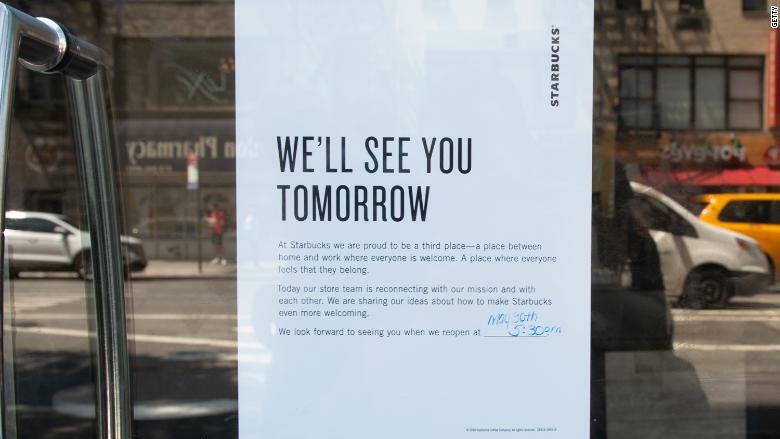 “Our hope is that these learning sessions and discussions will make a difference within and beyond our stores,” Starbucks executive Rossan Williams told employees in a note last week. Ifill and McGhee plan to issue a report in the next few weeks outlining a comprehensive set of issues they believe the company must address. They’ll also be evaluating the trainings on Tuesday to see how workers respond. Amarin (AMRN) continues to chug along as it approaches the finish of its REDUCE-IT study. The results for Q1 2018 were lower than initially expected, due to the effect of beginning of the year insurance deductibles on refills. However, Amarin is keeping its guidance for $230 million in net product sales still. REDUCE-IT will be extremely important for Amarin’s revenues going forward, although the 2018 effect on revenues will probably be fairly limited. Vascepa sales may still benefit in the long-run if REDUCE-IT only shows modest risk reduction, due to Vascepa’s favorable safety profile. Amarin’s net product revenues came in a bit lower (compared to its $45 million to $48 million guidance) than initially expected at $43.8 million. This was still up 27% compared to Q1 2017 though, and slightly better than the $43 million it estimated in its early April update. Amarin mentioned that sales growth was affected by beginning of the year medical deductibles (as usual), and that the effect this year was particularly strong. Vascepa tends to be more affected since it is a preventative drug treating “asymptomatic chronic conditions”. Given limited budgets, patients will often focus first on filling prescriptions for drugs with more immediate consequences if they aren’t taken. Amarin reached an agreement with Teva to settle patent litigation over generic Vascepa. Amarin currently has market exclusivity until at least 2020, but is battling generic drugmakers over patents that could give it protection until 2030. This particular agreement allows Teva to start selling generic Vascepa in August 2029, which is not that much earlier than the April 2030 expiry date for some of Amarin’s patents. This is a positive for Amarin as it gives them a lengthy amount of protection from Teva’s generic Vascepa and reduces Amarin’s legal expenses. However, Amarin’s battle continues against two other generic drugmakers at the moment. If a settlement or favorable ruling can be achieved in the other cases, then Amarin will be protected from generic competition for a considerable amount of time and will be able to reap the benefits if REDUCE-IT is successful. REDUCE-IT results are expected by the end of Q3 2018, which is only four months away now. 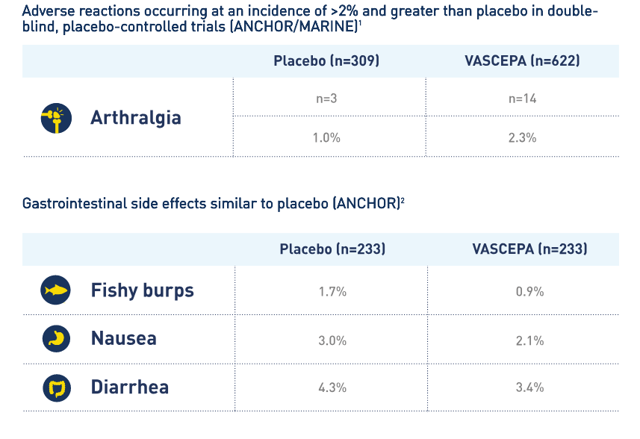 The study results don’t need to be particularly strong to have the potential to boost Vascepa’s sales due to Vascepa’s favorable safety profile. Amarin mentioned that its marketing surveys suggested that around a 7% to 8% relative risk reduction or better would be well-received by physicians. See source for full details. Of course, despite that relatively low bar, there is still considerable risk involved due to Amarin being a one drug company. If REDUCE-IT results are poor, Amarin’s stock will likely take a very large hit. Any investors should be prepared for the loss of a significant part of their investment in Amarin, even if they believe the risk of that happening is low. With Amarin trading for close to 4x estimated 2018 net product revenue, the stock should likely do well in the long-run even if REDUCE-IT shows only a modest relative risk reduction (as long as it meets the 7% to 8% RRR that physicians require). Given that relatively low bar for success, I am favorably disposed towards Amarin. However, although the odds appear good for Amarin, there are also quite significant negative consequences should REDUCE-IT display a lower level of relative risk reduction. Disclosure: I am/we are long AMRN.